Fantasy General II is announced! 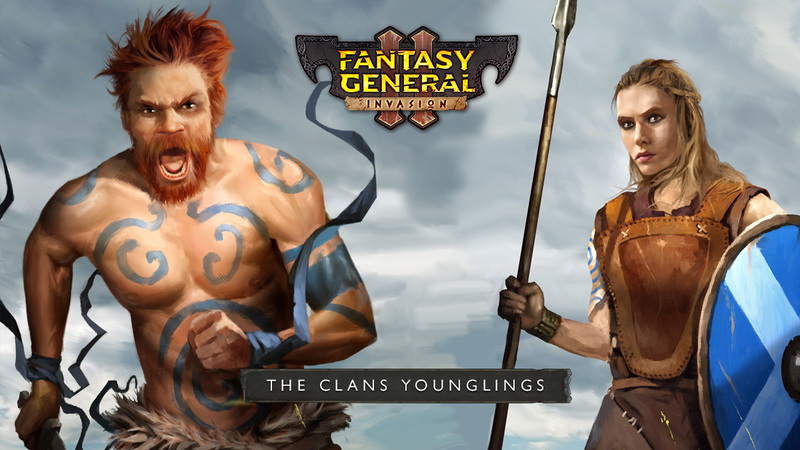 Fantasy General II is the reimagination of the strategy game classic from the 90s! Armies once again draw battle-lines on the war-torn land of Keldonia, and a new generation of commanders will test their bravery and tactics against each other. Three hundred years have passed since the Shadow Wars have ravaged Keldonia and the world of Aer, and the struggles of the past have long since faded into legends. In the Highlands of Fareach, Clans of Barbarian warriors have eked out a living in the harsh northern climate, constantly feuding with each other and raiding the wealthier Borderland towns. Fed up with these constant attacks, the Borderland Clans called on the Empire for help – a powerful realm controlling the land from the Scarlett Mountains to Cynehelm Valley and the Hoarwood. The Western Imperial Legion was sent to face the highland raiders, and with the help of the Borderland clans Iseal and Machnar, killed High King Brendan in the battle of Wyrm’s Pass. A treaty was signed that forbade any clan from crossing into the Borderlands in return for peace. Since then, there has been no High King to unite the Clans, and they fell into quarrelling and raiding amongst themselves. 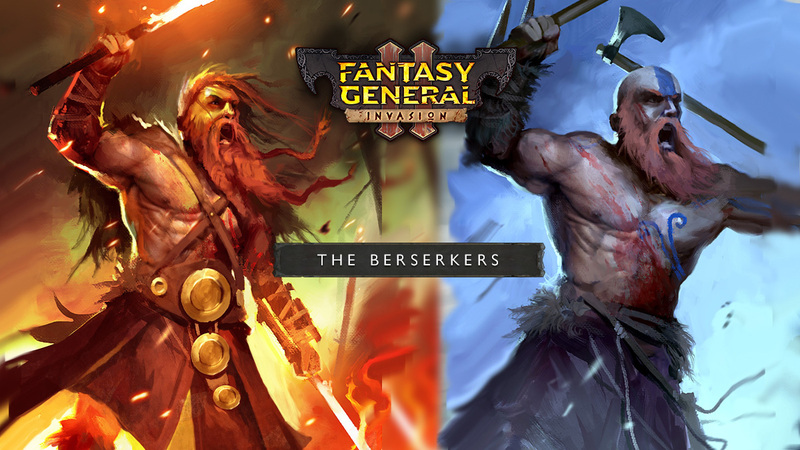 Fantasy General II - Invasion is the reimagination of the strategy game classic from the 90s! Armies once again draw battle-lines on the war-torn land of Keldonia, and a new generation of commanders will test their bravery and tactics against each other. Fantasy wargaming is back! True to the tradition of the original game, Fantasy General II is all about turn-based battles. Lead over 75 different unique unit types, including powerful heroes. Take into consideration terrain, weapons and armour, magical effects, morale, and the balance of forces, make a plan, execute it, and vanquish your enemy, forging your reputation as a savage war-leader. Battle after battle, you will need to make decisions and develop your army. The young clan members will need to be trained, and as they gain enough experience, even the greenest recruits can be turned into champions. But beware: costly victories can be worse than a defeat… when battle-hardened units perish, so does their progression and experience. Each unit comes with their specific abilities, arms and armour, and they can be equipped with magic artefacts you find during battle and upgraded with gold and resources that you need to plunder from your enemy. A confederation of autonomous hill-land tribes, who value their independence and will fight fiercely for it. Field axemen, berserkers, spearmaidens, trolls and shamans, summon ancestor spirits and mighty elementals or train nimble stag riders and deadly werebears or recruit mercenaries from longbowmen to centaurs. The most powerful realm on the face of Aer. Face the mighty Legions of the Empire and their magical creations from dragon cannons to golems as well as the Undead hordes they bring to battle, or fight harpies, lizard people and great dragons on your way. The world of Aer is filled with beauty and wonders. From the cold, magic-rich highlands of Fareach, home to the player’s Barbarian Clans, to the Borderlands with their fertile river valleys and deep woods where witches and monsters still roam free; from the Sunken Land, submerged through a great Cataclysm and filled with treacherous swamp and Lizardfolk, to the refined and temperate Empire to the South, home to wondrous cities and built upon undead labour. Your campaign will see you fight across very different battlefields, requiring variable tactics and army composition. Re: Fantasy General II is announced! For that reason we are opening a new Fantasy General II Discord server! The devs are in it, and we will be notifying you anytime we post anything about the game. It'll be the perfect place to speak with the devs and with the community. We will also be running some contests, and in the Discord server you'll be the first to know! By winning, you will be part of Fantasy General II's future, but let's not speak of that, yet. We are going to start posting about the units included in the game, twice a week, on Tuesdays and Fridays. There are over 75 unique unit types and we intend to cover them all, so this is going to be a regular thing for a while. We announced the game last week, and we were overwhelmed to see such a great reception! Lots of people wishlisted the game and applied to the Beta. We have also seen a lot of articles popping up on all major gaming sites, like PC Gamer, Kotaku, Rock Paper Shotgun, Gamewatcher[www.gamewatcher.com] and more. We are really happy to see a lot of interest about the game, and we are looking forward to telling you more of it. As we already announced yesterday, Tuesdays and Fridays will be the days of our weekly Units Focus, and every day we'll take a look at a couple of units. Wednesdays are also going to be very important days for Fantasy General II! On Wednesdays we are going to give you updates & news about the development, and we're also planning to post a series of Dev Diaries to tell you and show you more of the gameplay, starting next week. In other news, Beta has started, and the first lucky testers have been picked and they are already trying the game and giving us useful feedback. We read some concerns about Minimum requirements. Those are not set in stone: optimization hasn't been completed yet, and we wanted to receive some good feedback from our testers. Plenty of people have been testing Fantasy General II on Windows 7 on the past few days, so we're glad to announce Windows 7 will be officially supported. The fiercest warriors of the Clansmen become berserkers, who can gain magical abilities and go into a frenzy, slaying even the largest of opponents with wild abandon.